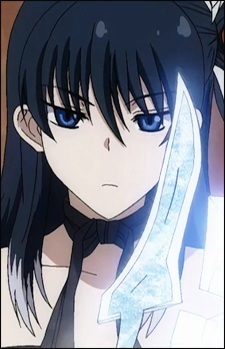 Tokiya's contracting demon, Nicknamed "Kori Hime (Ice Princess)" from her looks and character. Hiwako uses ice naginata named "Hyou-ou" when she fights. She became a Tokiya's contracting demon in order to find the truth about the world, from where it start and where it ends. At the Central Vortex, Hiwako and Tokiya clashes against Tomoharu and others to settle the score once and for all. Hiwako also had different color in her eyes when she unleashes her demonic power just like Kanade but after she became the contractor of Asura Cryin', both of her eyes changes into green, same with Kanade. After Hiwako and Tokiya was defeated by Tomoharu and Kanade, Hiwako became a normal human because every irregular things from First World, such as Asura Machina, Demon, and Daughters vanished, thus ending her contract with Tokiya. Hiwako transfer to Rakurowa high school and joins Science Club, giving big smile to Takuma, which make him fall for her at first sight.